Florida’s Agriculture Commissioner Nikki Fried gave details Wednesday about the new role she hopes the state Director of Cannabis will fill. “I have seen some progress at least in the senate on smoking, there’s two legislations that have been filed in the senate. So I hope through the legislative process that they get ques from the governor and fix the smoking. I will be happy to testify in any senate house committee or talk to any legislatures” said Fried. Fried has the three top candidates for the position, but did not say who they were. A day before her inauguration incoming Agriculture Commissioner Nikki Fried stopped by Second Harvest of Big Bend in Tallahassee to help fill bags and boxes with food for families. She took a break from community service Monday to address the media. 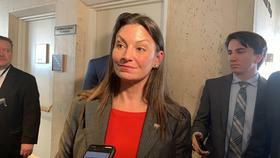 Agriculture Commissioner Nikki Fried added sexual orientation and gender identity to workplace protections at the Florida Department of Agriculture and Consumer Services. Fried, the lone Democrat to hold one of the state’s three Cabinet positions, is the first to add such protections to hiring rules that address race, religion and disability.